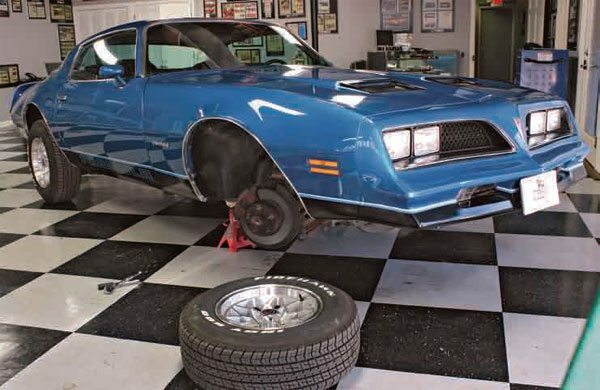 The stock front disc and rear drum brakes used on the second-generation Firebird were extremely robust and efficient. Depending on which road test you read, the disc/drum setup on the Firebird took about 160 feet to stop from 60 mph. 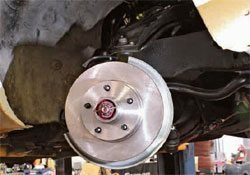 The rear disc brake option was offered as part of the WS6 Special Performance Package starting in 1979, which helped the stopping power even more. The new four-wheel disc brakes on the WS6 cars knocked some time from the stopping distance, bringing the Trans Am to 60 mph in only 146 feet. This 1978 Formula W72 was a limited-performance model with a 400-ci engine, which produced 220 hp and 320 ft-lbs of torque. Here, the front brakes are shown. 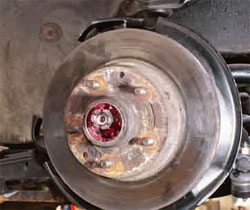 When compared to braking systems other manufacturers offered at the time, nothing compared to the Firebird brakes. Upgrades are available from various manufacturers, such as Brembo, Baer, SSBC, and Wilwood. These systems are also used with resto-modding, which is beyond the scope of this book. 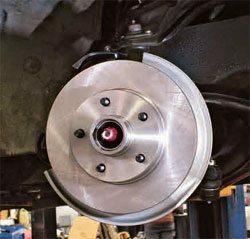 Brake upgrades are available that fit behind the factory wheel, but I am not sure that the additional cost translates into braking power that is superior to a perfectly operating factory system. 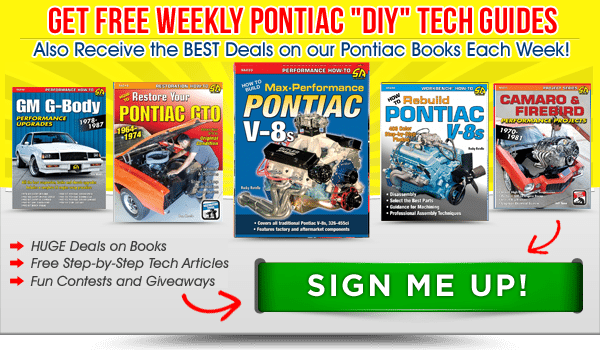 Replacing the front disc brakes on your Firebird is not a difficult procedure. 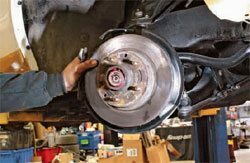 Using commonly available hand tools and following simple procedures, you can replace the brakes quickly and save some money too. 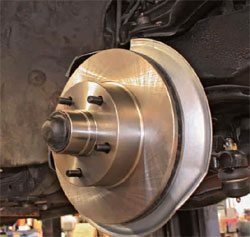 Having a professional shop replace the brakes is something to consider, especially if you use one of the major chains that offer lifetime warranties. 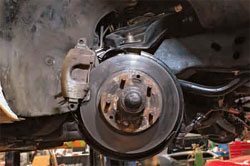 You may need to replace your brakes for any number of reasons. You have to determine what needs to be replaced if you are only doing a repair. If the Firebird has been sitting for an extended period, it might be prudent to replace every component for safety reasons. 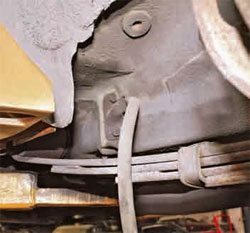 Inspect the brake lines to make sure they are not rusted, leaking, or bent. 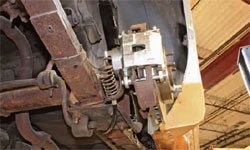 The braking system of the second-generation Firebird is very good and is relatively inexpensive to replace. Use a lug wrench or breaker bar and socket to remove the lug nuts from the front wheel that is receiving brake service. I advise breaking the torque on the lug nuts before jacking up the car. Use a breaker bar and socket. I do not recommend using an impact gun because the lug studs could snap or the studs could develop hidden cracks. The first step is to remove the brake calipers. To do that, locate the caliper pins on the back side of the caliper. To gain easier access to the caliper pins, turn the steering so the rear is pointing outward. Use a 3/8-inch Allen socket on a 3/8- or 1/2-inch ratchet to loosen the upper and lower caliper pins. Do not remove the pins yet because you need the caliper in place so you can loosen the rubber brake hose. 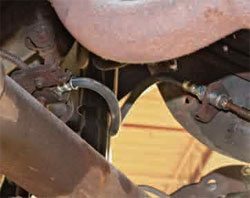 Pinch the rubber brake hose with locking pliers just tightly enough to keep fluid from draining. Using a 5/16-inch wrench to loosen the caliper bleeder to relieve pressure. 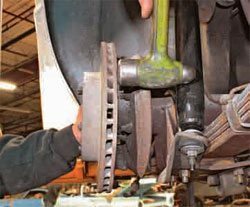 Remove the rubber brake hose at the caliper with a 7/16- inch wrench. It may be necessary to have a drain pan underneath or at least a shop rag to catch the residual fluid. The brake caliper should pivot and lift off the mounting bracket. 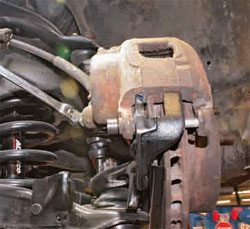 If it’s stubborn, wiggle the caliper off with a rocking motion. 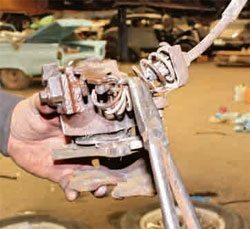 Use a 3/8-inch line wrench to remove the short section of rubber brake line from the steel brake line at the bracket. 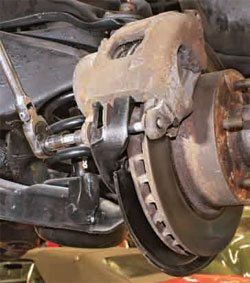 A retainer ring is located at the back side of the brake line bracket. Use a flat-head screwdriver or pick to snag it and lift it out. A dust cap is at the center of the brake rotor. Use a larger flat-blade screwdriver to get between the edge of the hub and the dust cap. Pop off the dust cap. Use needle-nose pliers to straighten the cotter pin and yank it out. Once the cotter pin has been removed, you have access to the spindle nut. Use an adjustable wrench to turn the spindle nut counter-clockwise to loosen it. It is not necessary to use a socket and ratchet, as the nut does not have much torque on it. Remove the nut. Slide the rotor out slightly to remove the keyed washer and outer bearing. You need to remove the bearing and grease seal from the rotor. To do this, reinstall the spindle nut and turn it clockwise a few threads. Grab the rotor with your hands placed at the three and nine o’clock positions. Pull toward yourself quickly and forcefully to pop the rear bearing and grease seal from the back of the rotor. Inspect the bearing and seal. You need to replace them if you see any binding or excessive wear. Remove the spindle nut and bearing and clean the spindle. 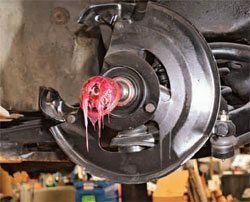 Apply fresh wheel bearing grease to the spindle. 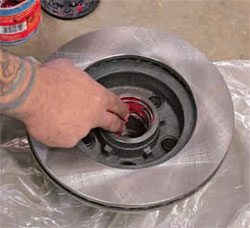 Use your fingers to evenly spread a coat of wheel bearing grease over the entire surface area of the bearing. This is in preparation for inserting the wheel bearing inside the rotor. Grease needs to cover the entire space between bearing and the bore. 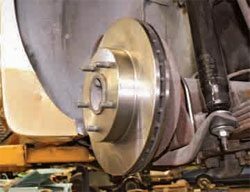 Bearings are inexpensive so I recommend installing new bearings when performing a brake job. Install a new wheel bearing after packing grease into the bearing orifices. Use a ball-peen or other suitable hammer to gently tap the new grease seal into position on the back side of the rotor. Inspect the rotor and make sure the rotor is true and there is no damage or flaws. Slide it onto hub. 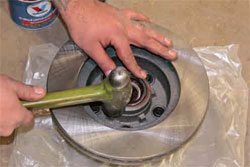 Install the bearing and key washer by just sliding them over the spindle and into the rotor. Use an adjustable wrench to tighten the spindle nut. Tighten the nut clockwise until snug. Spin the rotor counter-clockwise and tighten the nut until you feel resistance against the rotor; the rotor still turns but not freely. Back the spindle nut off a quarter of a turn. Turn the spindle nut until an opening in the spindle is clear on both sides of the nut. Install a new cotter pin and bend the ends around the nut. Place the dust cap square on the spindle bore and use a hammer to lightly tap it around the circumference until the cap sits flush against the rotor. Install a brake caliper rubber hose line and retainer spring clip. Install the caliper. Line up the caliper with the bracket. Slide the pins through the caliper and use the Allen driver to torque the pins. 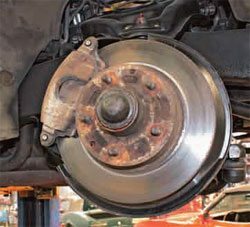 Lubricate the caliper pins with wheel-bearing grease by simply wiping some on with your finger. Install the pins. 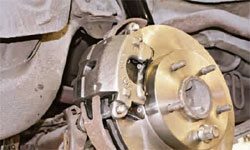 Install the brake hose by placing one end at the caliper and installing a new copper washer, which should have been included with the new hose. Reuse the bolt you removed earlier. The 1979 model year brought a major change to the Special Performance Package (RPO WS6). When you checked that option on the order form, you received four-wheel power disc brakes. 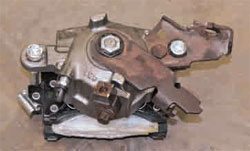 Having rear disc brakes in 1979 was considered exotic and, in the GM family, they were usually only available on the Corvette. 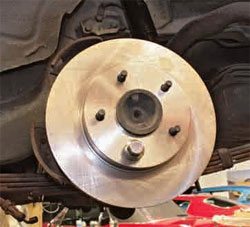 Rear disc brakes greatly simplified repairs and improved braking performance. The appearance of the rear rotors was also upgraded: They could be seen through 8-inch aluminum snowflake wheels that were also part of the option package. 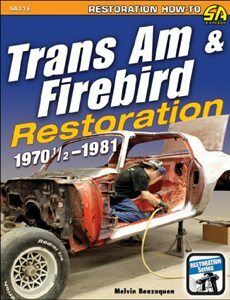 A four-wheel-disc upgrade to a Trans Am or Firebird provides a significant safety and control upgrade. This bolt-on item was originally offered as optional equipment in 1979, and therefore, it does not negatively effect the collector value of a second-generation F-Body car. 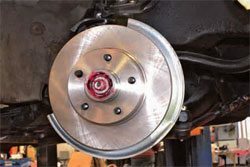 The brake upgrade was part of the WS6 Performance Package. It provides a serious performance upgrade compared to the standard hardware. 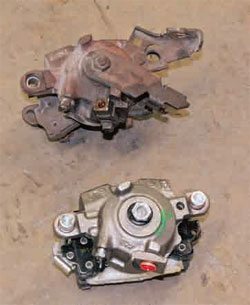 The rear disc brake option (J65 RPO) could also be ordered to replace the rear drum brakes. In addition, a WS7 Performance Package was offered in 1979. The WS7 package was essentially the WS6 package without the rear disc brakes. In the following procedure, you see the installation of a Macho Trans Am kit. 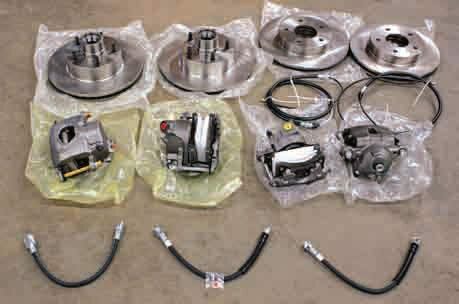 Here are the complete front and rear disc brake components to be replaced on the 1979 Macho Trans Am that is equipped with the WS6 Special Performance Package. This package included new-for-1979 four-wheel disc brakes. 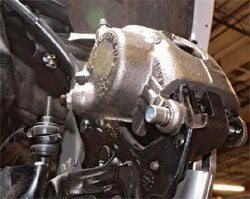 The rear hose that attaches the main front-to-rear brake line to the axle union should be clamped with small locking pliers toward the middle to prevent brake fluid from draining out completely while changing the calipers. 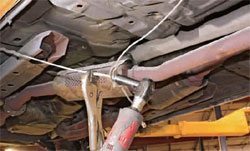 Do not clamp at the end of the hose because it can permanently distort the hose. As with the front brakes, the rear brake calipers are held to the mounting bracket with Allen-head bolts. 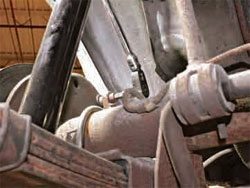 Like other parts subjected to corrosion, these may require a lubricant, such as PB Blaster, before they loosen. Use a 3/8-inch Allen socket to break the torque on the caliper retainer bolts. 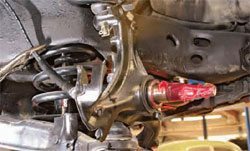 Use a 7/16-inch open-end wrench to remove the steel brake line on each end of the axle where it attaches to the caliper flex hose. Disconnect the flex hose from the caliper. 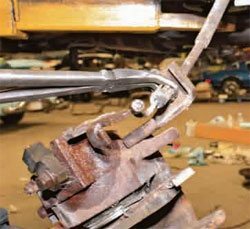 Remove the caliper bolts and then remove the caliper by removing the bolts and lifting the caliper off the retaining brackets. Use locking pliers to grasp the end of the parking brake cable. Pull on the cable and get some slack from the cable itself so you can move the retainer ball out of the bracket. Bend and twist the retainer to the side with the opening. Remove the cable from its retainer. 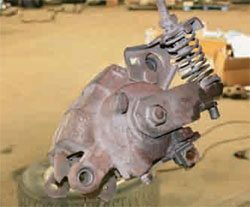 Compress the caliper spring by using hose-clamp pliers or other long- nosed pliers. Then remove the spring from the caliper pocket. Use hose- clamp pliers to compress the tabs on the park brake spring clip. Slide the cable end out through the bracket. Many accessory parts are not included with the new caliper (bottom). In fact, the new caliper does not come with the park brake bracket, cable retainer, and the flex-hose adapter. Remove them from the old caliper (top) and transfer them to the new caliper. The brackets are keyed so they end up in the same location. The flex-hose adapter only goes on one way. The caliper brake bracket uses an 11/16-inch socket, the cable retainer bracket uses a 9/16-inch socket, and the flex-hose adapter uses a 7/16-inch socket. Here, the original brackets have been transferred to the new caliper, and the flex-hose adapter has been installed. 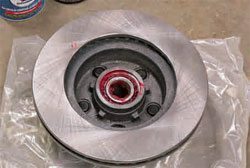 Because brake parts are subjected to a lot of moisture and debris, they often rust together. 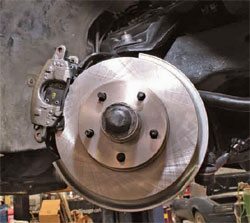 If your Firebird has not had brake service, the rotor may be very difficult to remove. Use a ball-peen hammer to strike the rotor in several places to separate it from the hub. Do not use any type of heat source as the spindle could be irreversibly damaged. Once the old rotor has been removed, you simply place the new rotor over the wheel studs. To keep the rotor secured to the hub, hand-tighten one lug nut until it seats against the rotor. This holds the rotor in place and keeps it straight. Use a socket and ratchet to remove the 1/2-inch bolts that secure the parking brake bracket to the frame rail. These can be rusted so they may need a treatment of thread lube. Remove the Mickey Mouse ear–style retainer clip located on the opposite side of the frame rail using needle-nosed pliers. If you have difficulty in getting the pliers into that tight space, you can try to pop off the clip with a flat-blade screwdriver. Attach locking pliers to the threaded rod on the main park brake cable to prevent it from spinning. Use a 1/2-inch wrench and socket to remove the cable from the retainer. Slide out the rear parking-brake cable. Mount the calipers on the brake rotors and align them with the mounting bracket. Slide on the calipers at a 45-degree angle. Install the new cable and calipers in reverse order of the disassembly. The cable end snaps back into the bracket.